I have been using Instagram for only 8 months now and observing the very successful and unsuccessful IGers, I have some thoughts to share. The following post is my crystallized tips on how you can experience explosive growth (like me) and gain very high user engagement on Instagram. This post is all about hacking Instagram. Ready? I am going to do this blog post a little different. First, I’ll give you the main course. Then I will serve you the dessertÂ (i.e my own growth story and timeline) and then finally I will serve the appetizers (what I am going to do in the next 6 months). You should chew on the main course and try to apply them to your own strategy. Then you can move on to the appetizers and try to do the same and match results after 6 months. 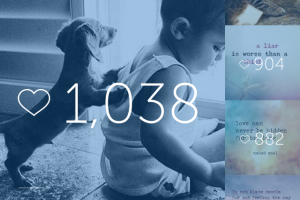 Engagement is the number of likes, comments, shares, mentions, tags, etc. Remember, engagement with your fans is much, much higher in importance than your number of followers. Or even the total number of Likes. 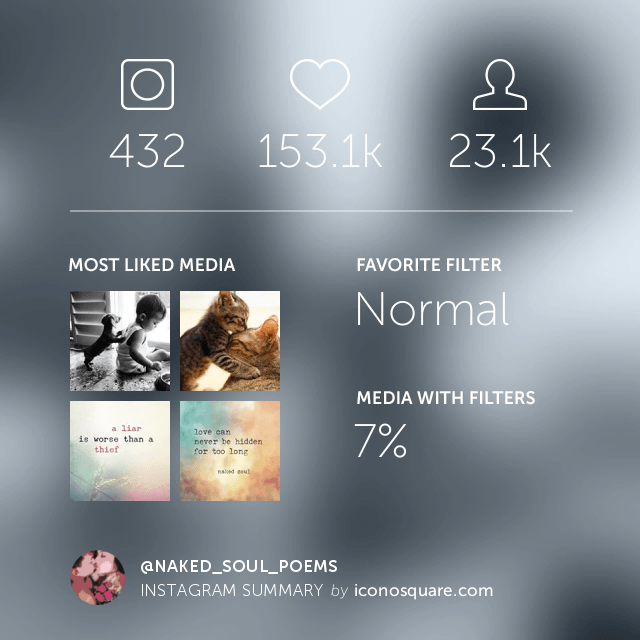 For example, @The.Naked.Soul has a little over 44,000 followers but our average Likes is somewhere in 300-400 range and average comment per media is 20ish something. That’s not a lot, but that’s not bad either. However, I would like to increase my engagement score. Now, consider doing this exercise. Go to Instagram and find out at least two accounts (that are your size, +/- 20%) that get a lot more comments and/or likes than you. After you have found them, follow them (try to build a relationship with them). If they do not follow back, it’s okay. Your main job is to study their post, timing, the way they write their caption and how they interact with their fans. Â Study them and try their techniques, one at a time. See what clicks with your audience. Stick with the best and leave what doesn’t work. The longer you have been posting on Instagram, the more likely is that the people those who follow you will remember you (your name or your brand name). Over time, seeing your name regularly in their homepage feed, your followers will begin to trust you more, read more from you and perhaps even begin to connect with you more. How long have you been Instagram matters! If you are reading this, my guess is you are a (relatively speaking) new account. Don’t worry. Keep patient. Know that Instagram has only ~700 million users and at least a good 10% of them are dupes and scam accounts. My guess is the real “active” users must be in the range of 500M. So what does this mean? This means that as more and more people join Instagram, your account will be considered older in due time. So remember, account age – it matters and over time, this factor will get in your favor as you are here for a long haul. The more frequently you post, the more you are going to stay in people’s short term memory. The world today is an overcrowded place with too much information flow out there. People have a very short attention span. To be remembered and trusted as a reputable brand name, you have to be constantly out there. You can not afford to not have an active presence. Besides, the more frequently you post, the more new people you reach out to. People live in different time zones and new people find you using hashtags. Each time you make a new post, your use of hashtags makes you reach new potential fans. One more point, the more frequently you post, you increase your chances of being read by your followers. Remember, your average fans are also fans of many other things. They have several things to read at any given time. When you post frequently, you can hope that they notice you and actually read your content. And no engagement can occur unless someone feels connected to your words. I suggest you post 3-4 time per day. This should be a cardinal rule, not to be broken at any cost. Okay, so this comes right after the point made above that you should post frequently. But you should not post recycled and boring content. Try to post original content if they are not world class. Occasionally, you can throw in a good quote or a sweet little poem or a cute puppy picture or a half-naked selfie but try to post interesting, never seen before, new content. It could be an artsy view of the street lamp in your city or it could be anything as long as it’s artful and interesting. Also, when you post original content you tend to get more quality followers who really enjoy your Instagram gallery. These people are priceless since they really enjoy you. What to do if you do not have tons of good, original content? Well, in the beginning, keep to one post a day and build from there. Also being under the pressure that you got to make a new quality post will also spark your creativity. Post one original, and one daily quote. As you can see, I have come down from 1000 new followers a week to 376 new followers last week. No man or woman can achieve much on their own. You need help from other people. It is crucial to build relationships with other similar accounts (early on) to gain additional visibility. Everything at the end of the day comes down to “trust”. When you build partnerships and alliances, you gain instant trust in the eyes of the fans of your partner. Use this strategy effectively. Action Item: Find alliances you can partner with other accounts (your size) for the long term. Do not do blind shout-4-shout, as doing this a lot will make your account look “too promotional”. When I started @The.Naked.Soul account, I did some S4S (perhaps ten in total) but only after I had gained at least 1000 followers. And I never did s4s more than once a week, and rarely twice per week. Tip: Post a lot of great content first. Gain followers. Aim to cross 1000 followers mark, or 500 (depending on your goal) and only then engage in #S4S. Do free giveaways based on some sort of challenge, lucky draw or even better create a competition. Plan on doing something in the next 7-10 days. No worries, trust me, give it a try. 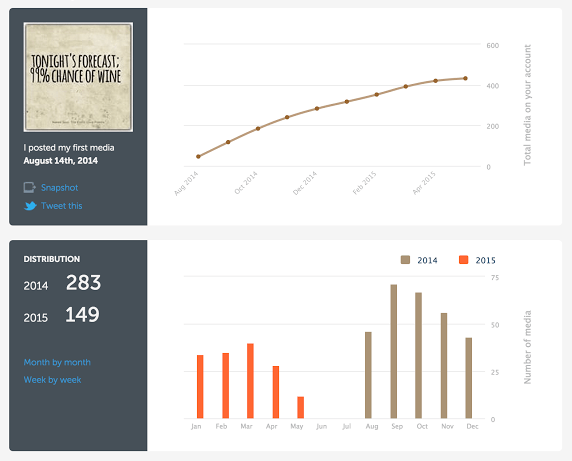 Once you have created some giveaway and/or challenge, track your performance. Write your case study and then share here in the comments. Also, by doing these sort of thing you will get comfortable doing any future promotional event. If you are a writing account, consider organizing 8 words or 9 words poetry contests or week-long poetry challenge. Try anything new and creative. Give it a twist. This will not only engage people but also propel words about your account. Moreover, people always love free stuff. Remember, “free” is an effective marketing strategy. The more people participate, the more new followers you gain. Okay, so this is the last armament in our arsenal, but very important. Without this nothing will happen. To grow on Instagram you will have to expose your account (your media be it pictures, videos or even written quotes) in front of a large audience. This is humanly not possible. This is where steps 7 – 9 Â comes into play. First, you need to start engaging with real people out there. Nothing happens until you meet a few right people. A few right Instagram friends and your comments start soaring which in turn draws other people and comment and engage in a conversation. You start commenting and building a relationship. Doing this consistently will get you cross 1000 followers mark easily. However, if you are aiming for 100,000 followers or 1 Million followers, read on. Next, you need a tool that you can automate to send Likes and comments on your behalf. Automated comments mostly come as spammy and therefore I do not recommend it. Sending mass Likes is one easy way to expose your username to thousands of users on a daily basis. A lot of these users (whom you have given Likes) would check you by clicking on your username. On your profile if they find that they like your gallery or if you are an interesting person, they will follow you. Some of these people will be themselves interesting and you can follow them back. In this step, also remember to geo-tag your pictures as well as it will help people looking for users or pictures from a particular place find you. I used to geotag places around Boston but now I simply put my website in location. Next, as mentioned above, you need some power users. Users those are actively engaging with the content similar to yours. One of the best ways to find such active users is by looking at the comments on the pictures of your closest competitors. Read the comments, reply to a few of the commenters. This strategy works best when the account is so large that they ignore all the comments/commenters all together. But people ask questions in the comments all the time. This is your opportunity. Answer the unanswered questions. Â Actively engage with these audiences. Remember they are the power users. These people have already shown interest in the niche that you are part of. Turn your competitors’ followers into your followers. The more you engage, the more output you’ll get. Above all, never forget that you are dealing with human beings with feelings and emotions. In execution of any of these strategies, do not do anything rash. Keep patient, go slow and keep reasonable goals. Over time your account (business or personal) will grow. Now we come to the most important strategy. All the above-mentioned strategies will bring you the result but not at a pace which can make your account cross 100K followers in 6 months or 12 months. To really create a big Instagram follower, you would need a shout out from a big account or better many big accounts. These endorsements, or call it sponsored post can be free or paid. The way you can have a big account give you a shout out is by sending your product for their review. They get a free gift and they post a picture of your yours or your product with your account name in their caption and boom! There you go! This is where you start making a measurable impact. You need to DM and/or email to other, larger accounts in your niche, exposing your brand to their audience. First, make a list of all the large accounts in your niche. (Usually 10K-300K). Leave accounts with millions of followers for now as they will most likely not hear to your request or their cost will be beyond your humble budget. Second think beyond your niche. If you are a flower business, think of gardens, love poetry and other flower related domains. Third, make sure you are already following these accounts, if not, follow them before you reach out to them. Fourth, find their email address and email them. If email is not available, DM them and also comment and ask your question that you have a question how can you contact them. When you finally do get a hold of them, ask them if they would like to receive your product for review. Tell them that you think they will like it and you have following them for some time now and you can guess if this would be a nice thing for them to try, read, apply, review, etc. Second, ask them their sponsored post pricing. This is to be asked even if you are giving away a free product. Especially, if the account is above 100K followers, ask them. Smaller accounts will give you a shout out for no cost but larger accounts might charge you since they might be getting similar pitches from other people as well. Third, depending on the size of their audience, stick to $19-$49 per post shout out/endorsement. There are hundreds of tools out there that can help you and your Instagram strategy. In this post I mentioned five key ones help you build your audience and engaged them. 2. Schedugram – Schedule your Instagram post for the most engaging times. If you have trouble finding times to make posts on Instagram, this tool is your savior. 3. 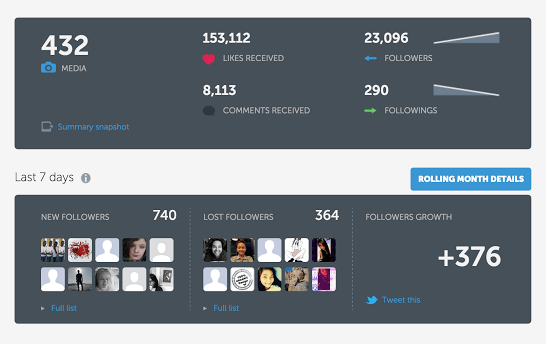 Webstagram – A tool to find the best hashtags for your posts and people for your sponsored/endorsement posts. When you do a search for particular keywords, Webstagram will also show you the top Instagram accounts that feature those keywords. Okay, so what’s next for me personally. As I said earlier, all the above-mentioned strategies are the tested ways to grow your followers count or to grow your brand engagement score. However, as I have started to give more time to this blog, I have become more passive towards my Instagram growth. But, I want to change that. I do want to blog more frequently but not at the cost of slowing down my Instagram growth rate. So this is what I am going to do in the next 6 months. 1. I have not taken advantage of Sponsored posts (even though I have seen it since day one). I am going to make a list of big accounts (50K – 400K) and them send them a copy of my book and artworks and will ask for a free or paid shout out. 2. I am going to restart using Instagress/Instamacro. I used them for the most part of my earlier growth but then stopped using it. So, I will be reusing the auto-Likes feature. I am not so sure about the auto-comments at this time. 3. I am going to blog more frequently. This way I am gaining exposure that is beyond Instagram. This will also lead to further growth on my Instagram. 4. I’ll start pre-scheduling my Instagram posts. My goal is to post more frequently. My current average post frequency is 1.5 posts a day. I want to increase it to 4 posts a day. 5. I’ll keep following and taking advantage of all of the above 1-10 steps, tools and techniques. Have you used any of the tools mentioned in the post today? If you know of any other strategies to hack Instagram super growth that I have missed here, please let me know in the comments below. Also, if you are going to use my strategies, and find success, please leave me a comment as well. Any other comments, please feel free to share your rich thoughts with us. I’d like to start a blog so I will be able to share my experience as well. Inspired by you. Please do so Willy. I am happy to hear that you are finding value out of this blog. If you need any help with blogging, do not hesitate to contact me. This post is genuinely a pleasant read. Love it. Thanks Kim! Let me know your Instagram growth success story. Share again! Thanks! Great post! Something new that I read and learned! Thanks for stopping by Cheri! Glad you found this piece informative and educational. Keep reading! I have tried a few tricks that you have mentioned. I grew my account 3 times in just past 1 month. Yay! I am happy for you Goldy! Great! Thanks Lucius. I am glad you found the tips helpful! This is the perfect post for me to find at this time! Thanks Vic! Glad it was helpful! You can contact me through the Contact page (top right most tab on my blog). Hi Shweta, yes, I do have a recommendation for you. Join Quora and just ask your question. You will find tons of questions on almost everything including Instagram. Let me know what you think of it? Your method of explaining the whole thing in this article is truly nice, every one can effortlessly understand it, Thanks a lot. Interesting! I haven’t gotten to the point of making an Instagram account for my blog. This is the push I needed! TY! Hi Megha! If I can be of any help please do not hesitate to ask me. Best. No selfies needed! That’s no. 1. Hi Kim, you are totally right. Too many selfies can drag down your social authority on Instagram. You have to be really creative and smart when it comes to selfies. Use them in a tactical way to show who you are. Nothing wrong with a few. But over do them and you become merged with the crowd. Great point. Thanks for sharing. Loved these tips!! Thank you for this. You are welcome, Zenia! I wish you much success with Instagram in 2018 and beyond.